This recipe is for the creamy style of Thai iced tea that most Thai restaurants in America serve (ชาเย็น, also known as cha yen, cha nom yen or cha yen sai nom). While many Thai iced tea mixes often contain a low-grade powder or syrup, this authentic recipe gets its flavor from good-quality black tea and spices without any artificial colors. The best part is it's easy to make and far cheaper than buying it. Similar to hot Thai tea, real Thai iced tea is a mix of black tea, spices, sugar, sweetened condensed milk, and evaporated milk. It's a great drink for fans of masala chai and other spiced or milky black teas. If you don't have every one of the spices in this recipe on hand, that's OK—you can skip one or two. But if you want the full flavor, seek out the somewhat unusual ingredients (such as tamarind powder) at your local Southeast Asian or Indian market. Although you can use teabags, it tastes better with loose-leaf tea because the flavor is richer and more complex. Steep the tea, star anise, cardamom, optional cinnamon stick, vanilla bean, tamarind powder, and almond extract in the boiling water for 5 minutes. Stir in the sugar and sweetened condensed milk until both are completely dissolved. Fill two tall glasses with ice. Pour the tea over the ice, leaving an inch or so of space at the top for the evaporated milk. Top up with more ice if needed, and then drizzle with 1 teaspoon of evaporated milk on each glass of tea. If using mint leaves for garnish, add them now. Add straws if desired and serve immediately. You easily can make this recipe vegan by replacing the sweetened condensed milk and evaporated milk with cream of coconut and coconut milk. If you like this cha yen style of Thai iced tea, you also might enjoy cha manao Thai iced tea, which replaces the sweetened condensed milk and evaporated milk with lime juice and jasmine essence. It is especially refreshing in summer. 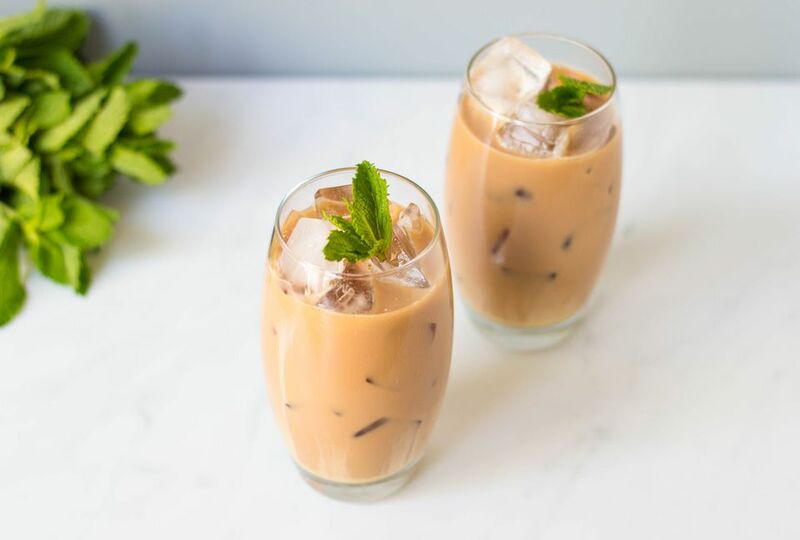 And if you're a coffee drinker, be sure to try Thai iced coffee, which has the same spiciness and creaminess, with a coffee base instead of tea. Thai Iced Tea Ultra Delicious!